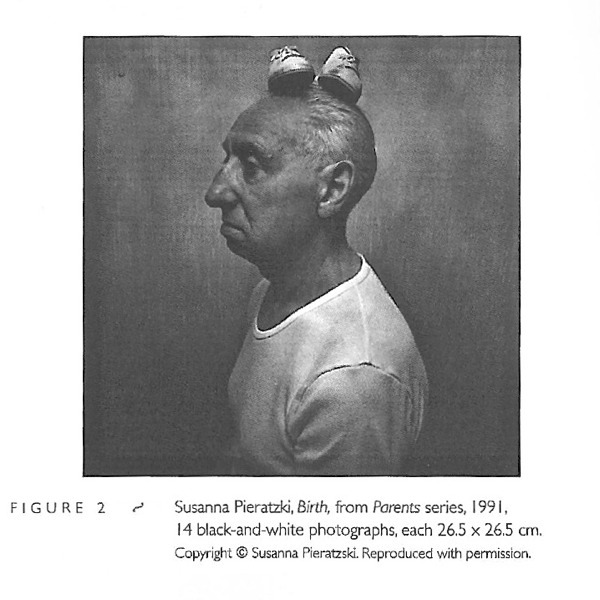 A 1991 series of carefully staged black and white photographs titled PARENTS by Susanna Pieratzky, also of German-Jewish origin, depicts her parents, both of them survivors, in a sequence of symbolically significant poses, and accompanied by symbolically significant props that relate to their life experiences. Each photograph is given a number and a title - such as Birth, War, Remembrance - that allude to a terrible, yet elemental life cycle. From "Empty Shoes", a chapter in the book "Footnotes On Shoes"